We are lucky not only to have a legion from the Vamos Brigade attending this year’s Indian Wells tournament, but also to have several of them blogging about their experiences and sharing their photos and videos with us. Some traveled across oceans and up to nine time zones, braving illness and attempted poisonings by airport concession stands. 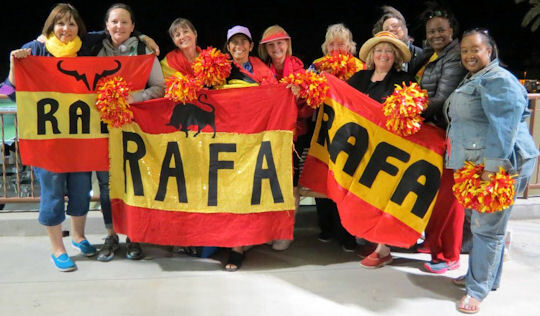 Many of them are IW veterans, who have memorized the grounds and shortcuts (adjusting for the additional construction and expansion that has been accomplished since last year’s tournament, of course) but there are also some "newbies" being shepherded through their first Rafa experience. Wise in the ways of Rafa's practice session routines, our members are also extremely creative when it comes to cheering gear. 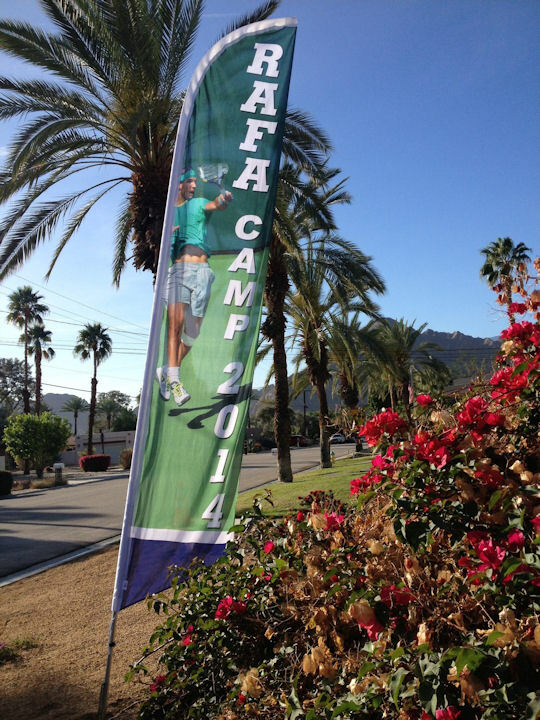 Rafa has often said that Indian Wells is one of his favorite tournaments. Last year, the hype had been about Rafa’s return from injury. This year, it’s about his return as defending champion. No comment about that mural. jen, a/k/a raficionada on YouTube, caught this instance of Rafa's borrowing (and, of course, returning) Maymo's sunglasses. As the top seed, Rafa got a bye in the first round. (The 32 seeded players get byes.) His first match was against Radek Stepanek. Rafa led their head-to-head 6:0, but Stepanek is a cunning and skillful player, who is very comfortable at the net and would likely try to prevent Rafa from getting into a rhythm. The first set was tense enough to send MAC behind her lucky T-shirt. Stepanek played high-risk tennis, going for acute angles and the lines – and finding them. Rafa’s serve caused additional tension: he double-faulted three times and really won no free points with it. He was broken twice and was unable to convert any of the four break points he had managed to manufacture. Stepanek won the first set 6-2. Rafa served better in the second set, winning every one of the points in which he got his first serve in. He also converted his only break point (in the fifth game) and held his serve for the rest of the set (albeit double-faulting twice more). 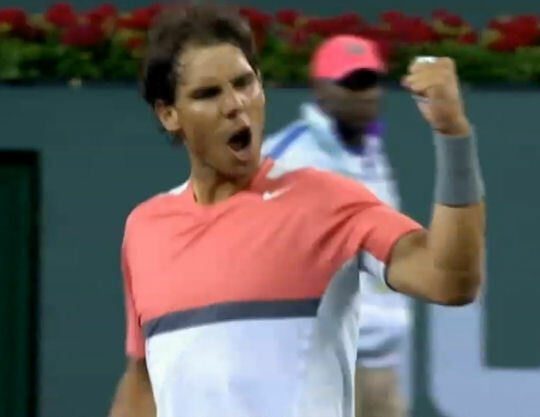 Rafa won it 6-4, and evened the match at one set apiece. The third set started off well, with Rafa breaking Stepanek in the first game. But, Stepanek broke right back. Rafa seemed under pressure a lot of the time, but his court coverage was sublime. Stepanek’s doubles experience made him very comfortable at net, but Rafa had started anticipating Stepanek’s tactics better and there were times when Rafa seemed to streak across or forward in the court so fast that it was startling – to the audience and to Stepanek. Rafa’s serve was still unreliable as he double-faulted three more times during the third set. Rafa eventually held for 3 all and managed the crucial break in the 11th game. He served it out, winning the third set 7-5, and celebrated with relief and joy. In his English-language press conference after the match, Rafa disclosed that his serve had been “off” because of concern for his back. I give him a little bit of advantage because with my serve I was not doing nothing. So when that happens, the opponent is able to play more aggressive, play more confident, and in the end eight double faults I give him opportunity to win a lot of free points. You know, a little bit scared for the back. I am not feeling yet 100% confident with my serve. Even if my back is better than Rio -- in Rio I was feeling the back not very well. [A]fter Rio, I did treatment there in Rio just after the final and I didn't serve for 10 days. So I was starting to serve few days ago just -- that's normal. That can happen, no? Unfortunately, Rafa lost to an inspired Alexandr Dolgopolov in the next round, 3-6, 6-3, 6-7(5).